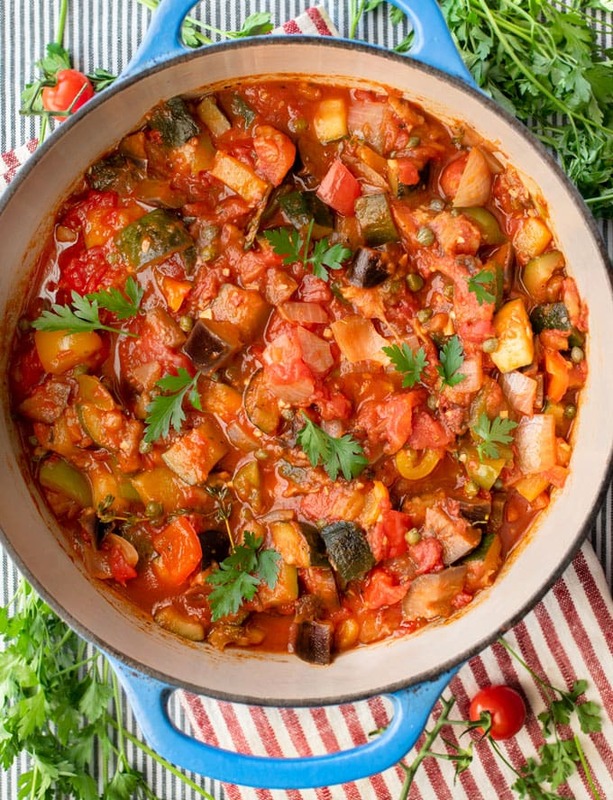 I love ratatouille: a rainbow of healthy vegetables simmered in garlicky tomato sauce and herbs; a delicious vegetarian side dish that’s both comforting and low calorie. But so many ratatouille recipes are complicated and time consuming. 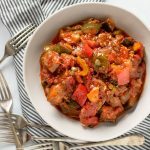 For those of us who want ratatouille in our regular dinner rotation, here’s an easy ratatouille recipe that’s as good as any I’ve ever tasted. 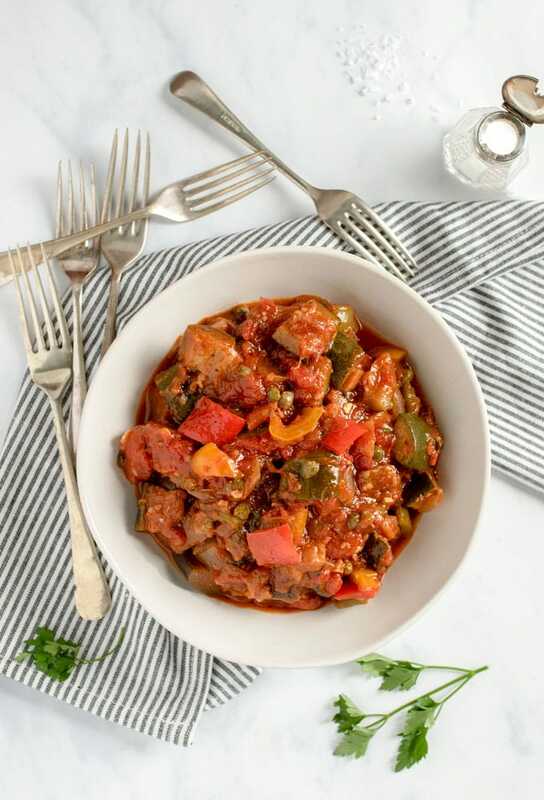 I agree with Julia Child when she says: “Ratatouille perfumes the kitchen with the essence of Provence and is certainly one of the great Mediterranean dishes.” When you’re wondering what to make for dinner ratatouille can be the foundation for so many delicious meals. I love serving this easy ratatouille with pan seared salmon (recipe below) or roast chicken. It also makes a terrific primavera sauce for pasta. Sprinkle with parmesan cheese and fresh slivered basil for a tasty finishing touch. For a fantastic vegetarian main dish, scoop a generous portion of ratatouille onto a plate and top with a fried or poached egg. Drizzle with extra virgin olive oil. Sprinkle with sea salt and chopped fresh herbs. Yum! If you’re wondering what the authentic recipe is for ratatouille, there isn’t one. Every cook does it a little differently. Some roast the veggies and then stew them. Others slice the zucchini and eggplant into perfect rounds and line them up in a casserole dish in concentric circles. Julia Child’s ratatouille recipe in Mastering The Art of French Cooking instructs you to cook each type of vegetable separately before combining them in a casserole. Very tasty but it takes a long time! What I love about this recipe is it’s easy! No salting of the eggplant, no pre-roasting, no arranging of veggies. This wonderful easy ratatouille, adapted from Craig Claiborn’s Recipe, takes about 30 minutes of prep and 30 minutes of simmering. The first step is to dice the vegetables: eggplant, zucchini, bell peppers, onions and garlic. Have the rest of the ingredients on hand: olive oil, canned Italian plum tomatoes, tomato paste, fresh thyme, herbs de Provence, a bay leaf, capers, salt and pepper. Start by sautéing the eggplant and zucchini for 5 minutes, to soften. Add the peppers, onions and garlic and cook, stirring, for a few minutes. Add tomatoes and tomato paste and give it all a good stir. Add herbs, salt, pepper and capers. Gently stir, cover and simmer gently for 25-30 minutes, until the sauce has thickened a bit and the flavors are melded. That’s all there is to it. Olives are often a component of classic French ratatouille. I love that Craig Claiborne uses capers instead of olives in this recipe. Capers add a perfect touch of salt and acid that brighten this dish without overpowering the delicate sweet flavors of the vegetables. 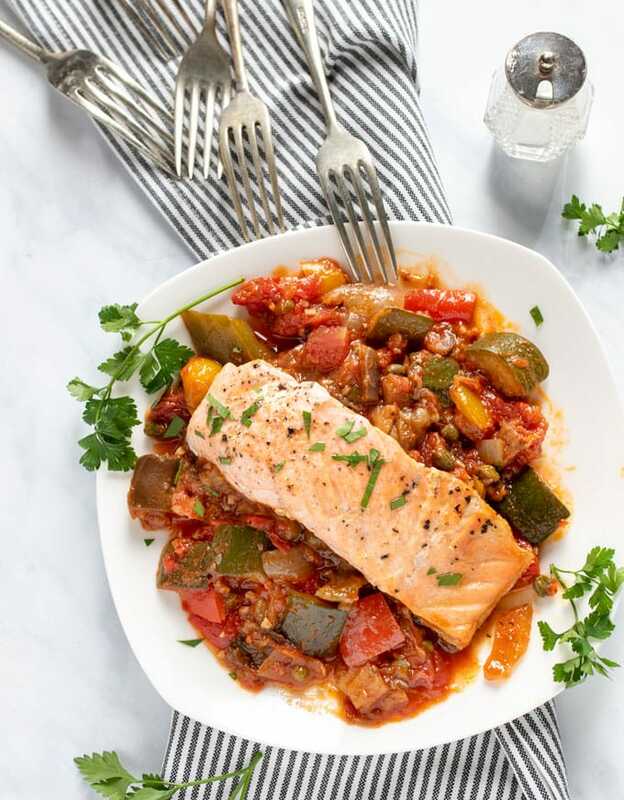 One of my favorite weeknight dinners is this easy ratatouille topped with pan seared salmon. Every bite is comforting, delicious and nutritious, and nobody misses the carbs. 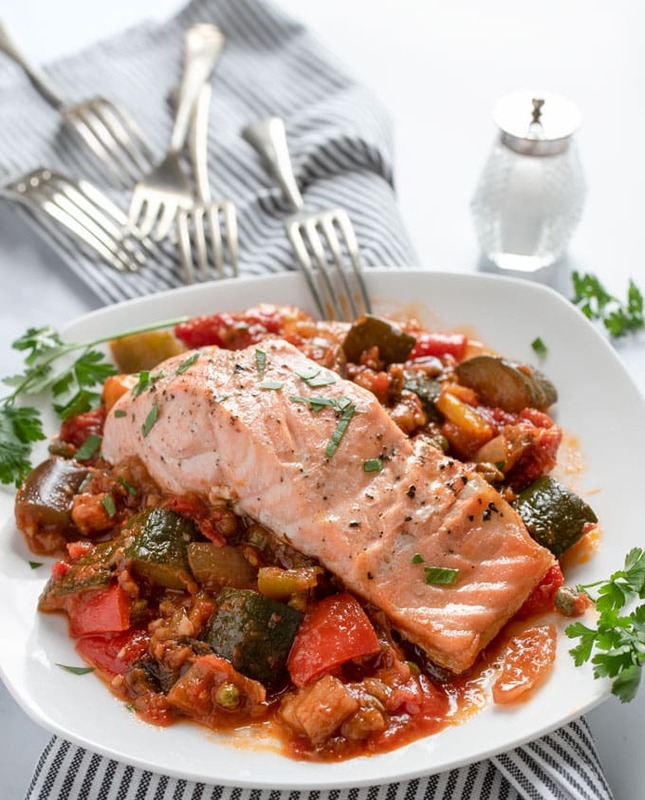 While the ratatouille is simmering there’s plenty of time to set the table and cook the salmon. Heat a heavy skillet (preferably cast iron) over medium-high heat. Add a tablespoon of vegetable oil and spread to coat the pan. Add the salmon fillets to the pan skin-side-down. Drizzle with a little olive oil and sprinkle with salt and pepper. Sear the salmon fillets for 2-3 minutes uncovered. Cover the pan with a lid and continue to cook for another 4-5 minutes. You want the salmon fillets to be slightly undercooked. Remove the pan from heat and leave the cover on for another two minutes or until the salmon is just cooked through. When you remove the salmon from the pan with a spatula, the skin will stay behind in the pan. Give the pan a soak while you’re eating dinner and the skin will come off easily when it’s time to do the dishes. 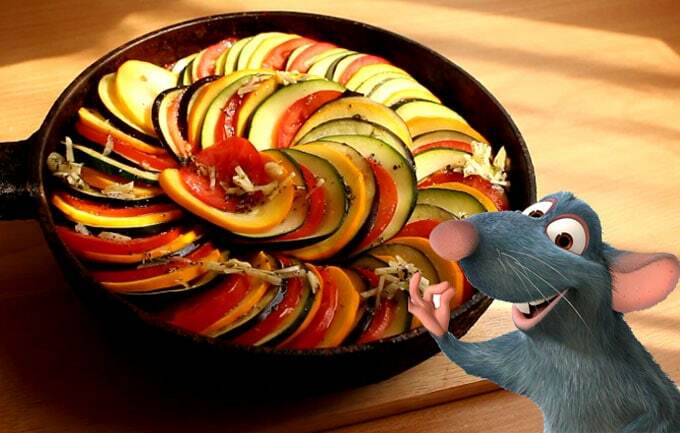 I can’t write about ratatouille without referencing the movie “Ratatouille.” Remy’s infectious love of cooking and his fabulous food-styling skills drew the world’s attention to this amazing dish. 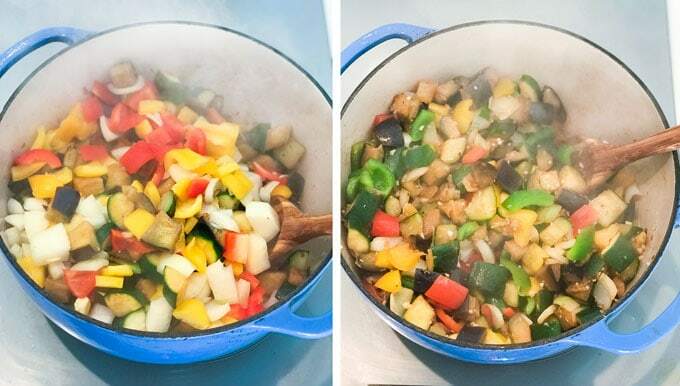 If you want to get fancy with your ratatouille, like Remy did, check out this recipe from a blogger who recreated Remy’s gorgeous rainbow ratatouille beautifully. 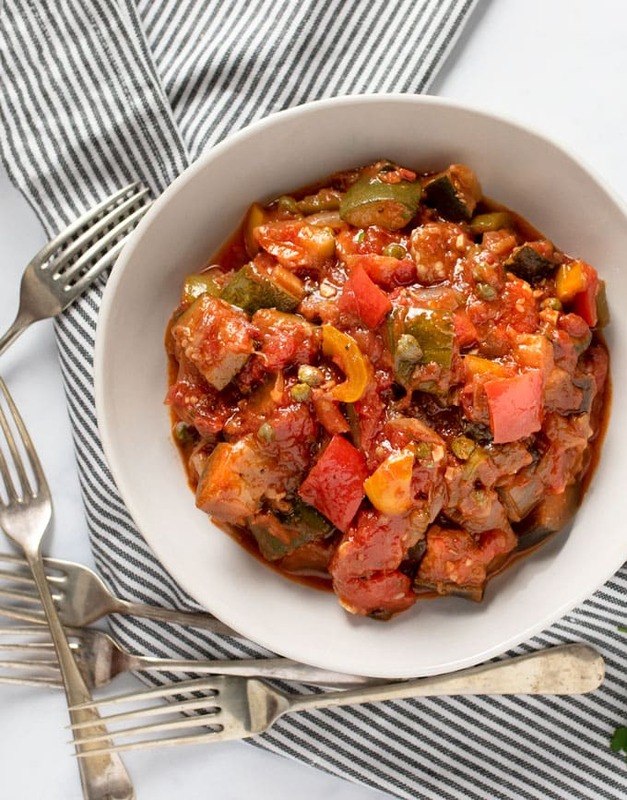 Here’s the recipe for this delicious easy ratatouille. If you try this recipe I hope you’ll come back to leave a rating and comment. I’d love to know what you think. A colorful casserole of vegetables simmered in garlicky tomato sauce and herbs. A wonderfully simple and satisfying vegetarian side dish that’s both comforting and low calorie. Wash the eggplant and zucchini and cut off the ends. Leave the skin on. Cut them into 1-inch cubes. There should be about nine cups of eggplant cubes and six cups of zucchini. Peel the onions and cut into half-inch dice. There should be about one and one-half cups. Core, seed and devein the bell peppers, and cut them into one-inch pieces. Heat the olive oil over high heat in a large heavy casserole or Dutch oven with a lid. Add the eggplant and zucchini. Sprinkle with a bit of salt and pepper. Cook, stirring often, until the vegetables start to brown, about five minutes. Add the onions, bell peppers and garlic. Cook, stirring, over high heat, about two minutes. Add the tomatoes and tomato paste, and stir to blend. Add the bay leaf, thyme, herbs de Provence and capers. Add a bit of salt and black pepper to taste. Bring to a boil, reduce the heat to a simmer. Cover and simmer gently for 30 minutes. A note about canned tomatoes. I always opt for using whole canned tomatoes and chopping or crushing them myself rather than buying canned chopped or crushed tomatoes. I find the quality of the whole tomatoes is better. But if you’re pressed for time and you want to buy canned crushed tomatoes, that’s fine too. If there’s a lot of liquid, drain them in a colander and then measure out 4 cups. Best (and easiest) ratatouille recipe I’ve ever made. Thank you!! This recipe definitely didn’t disappoint. I’m not a huge olive person so it was great to use capers instead. Another PanningTheGlobe recipe that tastes so good it’s hard to believe how healthy it is. I am a great fan of yours. The ratatouille was ABSOLUTELY delicious. We had it with couscous, next time we will add the salmon. Hope you are having fun in London! Hi Birgitt, I’m so happy to hear that you enjoyed the ratatouille and thrilled to know that you’re a fan. Thanks for your note – and Yes, I’m loving London. Cheers!